I purchased this corset on eBay back in 2009 with the intention of making a reproduction. Five years later I am finally making a go of this project, starting by studying the piece itself. It is a Victorian profile corset with lace along the top edge and flossing anchoring the varying-sized boning channels. 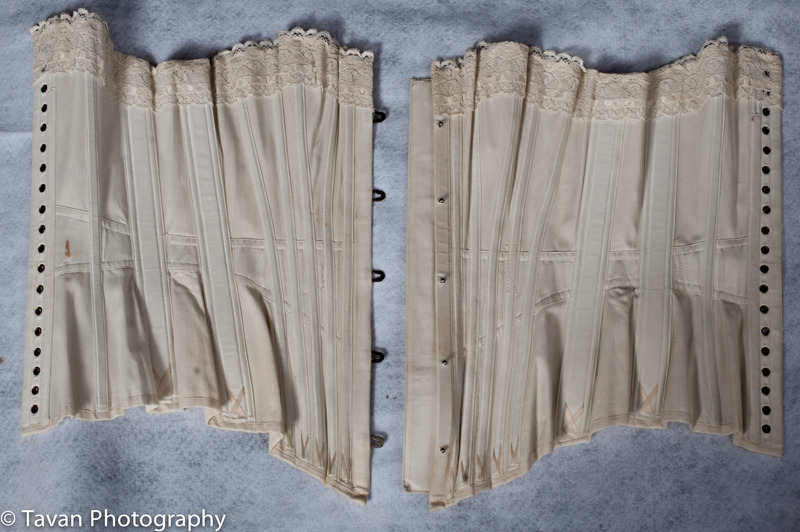 It was listed as “Antique WHK&S Victorian Edwardian Corset Size 24”. I wish I had saved more of the information with the auction but alas I did not. The corset itself is in very good condition and is a beautiful antique with little wear and just a touch of rust. (Fig. 2) and the additional boning “OKTIS” shield added into the corset which you can see obscuring the name on the waist tape (Fig. 3). You can also see the trademark of the company stamped on the waist tape like many makers chose to do during this era. Figure 2. Interior Side view of The “Catharine Hayes” Corset showing the aftermarket “OKTIS” shields and the lacing panel. Figure 3. A glimpse under the “OKTIS” shield showing the rest of the stamped name on the waist tape along with the Trademark Registered with a stylized W.H.K&S logo. 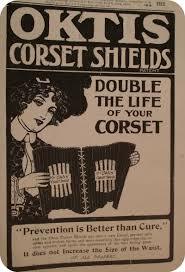 Without doing any specific research, the corset read as 1890s to me when I decided to purchase it. It is sewn by machine stitching, which dates it ito later than the 1840s. It is longer over the hip and straighter at front than earlier 1850-60s styles.The busk is still dished or scooped at the bottom front, not straight front like later Edwardian corsets. 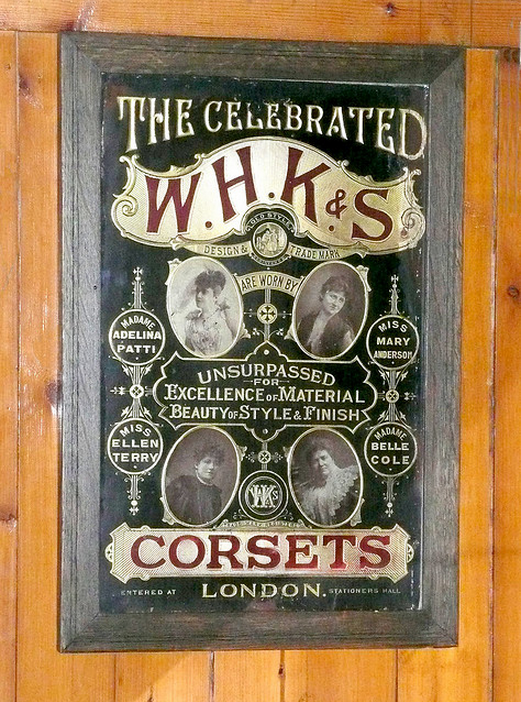 It does not have the swooped angled seam-lines of later Edwardian corsets. It comes down with a fairly elongated torso and extends a good ways down the hips. It still cups the bottom of the bust from underneath with a smooth transition from the under-bust over the waist to the hip. I would guess it is definitely after 1870s, when Victorian gowns started to follow the shape of the body more closely over the abdomen down into the hips, leading to corsets lengthening below the waist. This differs from earlier dress designs where the corsets did not need to extend far below the waist due to the hoop and petticoats hiding anything below the waist. These features point towards late Victorian period, probably 1880s-90s. 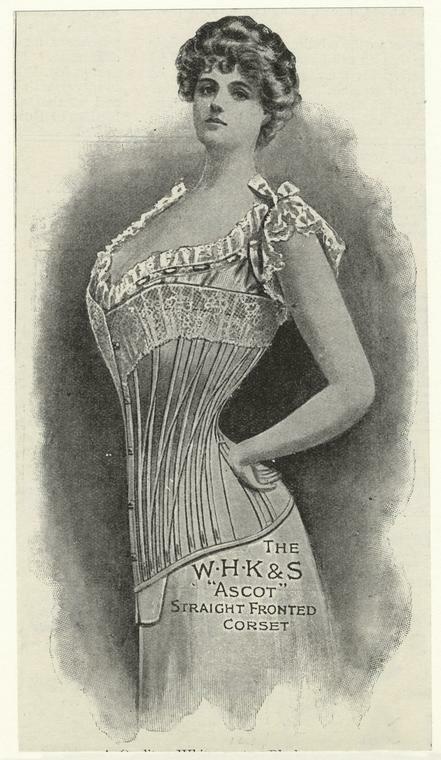 There is also an 1902 ad for the W.H.K & S “Ascot” Straight fronted Corset here (Fig. 5). 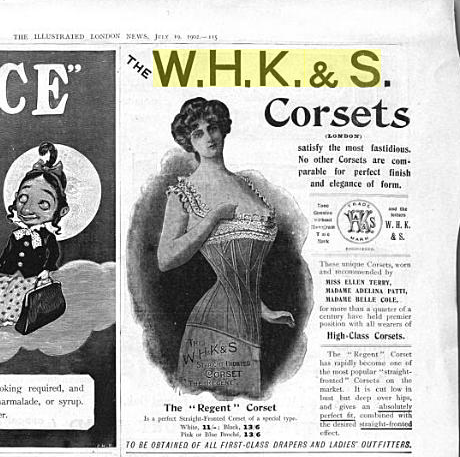 All the photos and advertisements I could find for the W.H.K.& S. company were from the early 1900s (Fig. 5,6,8,9,10). Thus far I have been unsuccessful at finding out more about them except that they were in London and still in existence until at least 1912. I have not been able to discover when when they were founded. The additional “OKTIS” shields stitched into the corset I assume were an aftermarket addition due to their being stitched on with longer stitches and haphazardly compared to the stitching of the corset itself. A quick search provided images and information on the OKTIS shields (Fig. 11,12,13). However, they can not be used to date this corset specifically because they could have been added to an older corset or re-used on a newer corset later. 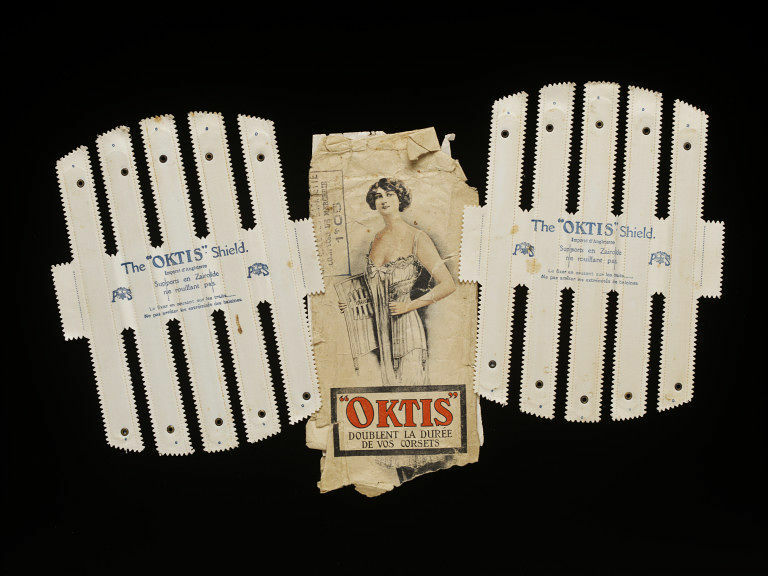 The OKTIS shields sewn into the “Catharine Hayes” corset (Fig. 14) were of British manufacture as stamped on them whereas the ones in the V&A museum were made in France (Fig. 11). Figure 11. OKTIS Shields at the V&A ca. 1900, made in France. I had a vague notion that this was a 1880s/90s corset. We tend to think of styles at distinct through the eras but really there are beautiful transition pieces. Perhaps this lovely example was a turn of the century holdover from an earlier period?. Looking over these details I still had a vague feeling it might be a transitional piece so I went to get another opinion. I contacted Lara Greene, who has a huge collection of antique corsets is more knowledgeable than I am on dating corsets. Lara asked me a bunch of questions including the size waist (a 24 Fig. 15) which would put at an average size, so not for a large lady. She also pointed out why she thought it was probably a transitional piece. Figure 15. 24 penciled in on the Center Back panel of The “Catharine Hayes” corset, matches the measurement of the waist. “It is the type, style and width of the lace which make it most likely Edwardian. It was the fashionable corset trim of the day. 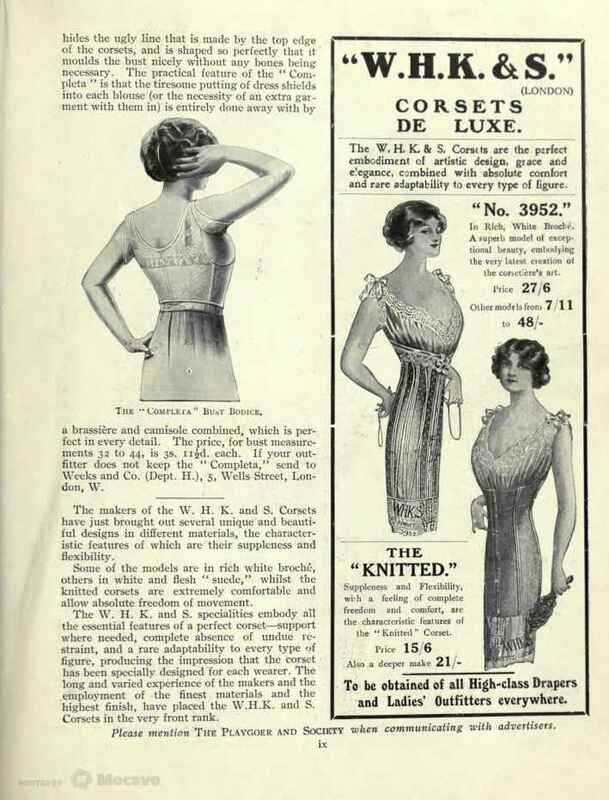 I have Edwardian catalogs with 1890s style corsets. They were available for those who insisted on the traditional corsets.” says Lara. 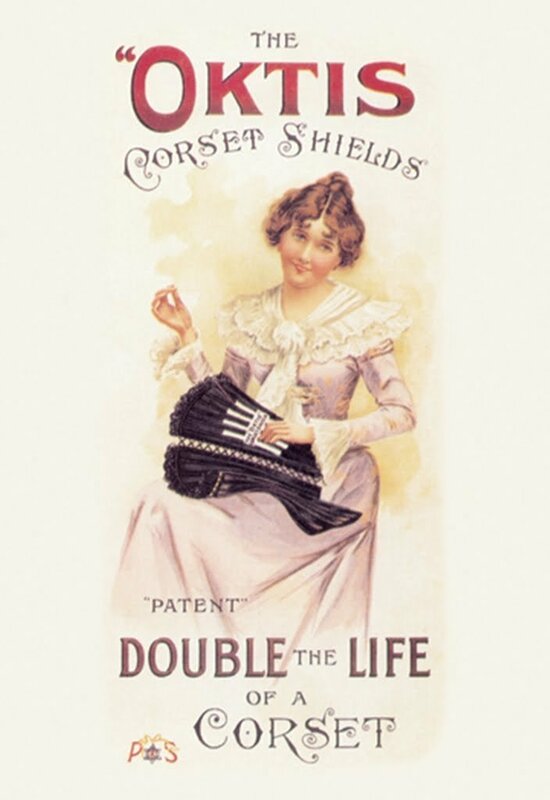 The dilemma stems from having the lace trim which itself is more typical of early Edwardian corsets (Fig. 15), whereas the straight-dished busk and overall lines and cut of the corset being it to the latest styles of the 1890s she explained. Figure 16. Lace on The “Catharine Hayes” corset up-close. “In my opinion- what you have is a corset for a traditional person of about 1899-1905-ish who refuses to embrace these modern bias cut corsets all the kids are wearing” said Lara. I am prone to agree with her. It was fascinating to hear about the lace and realize I have so much more to learn. Perhaps these same ladies would buy a corset named after a well known singer from their youth? The time period of the corset aside, we should look at the details of the corset in more depth before attempting a reproduction of it. Figure 18. The “Catharine Hayes” eyelet back panel. Figure 19. 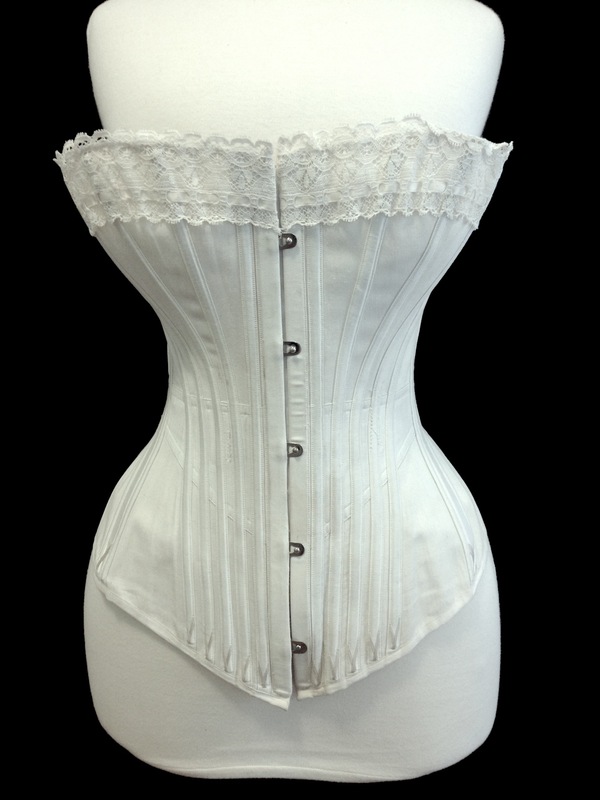 Curved under-busk runs almost the full length of the center front of the corset and is stamped “Special underbusk” with CBC trademark. Figure 20. Side view of the curved under-busk and busk of the corset. Figure 21. Busk loop side of the corset showing the shaping of the waist girdle and boning applied over the seam lines. Figure 22. Busk post side of The “Catharine Hayes” corset. Figure 23. Interior of The “Catharine Hayes” corset showing the seam lines and the waist tape more clearly. Figure 25. The center back as well as the larger bones on the sides of the corset are magnetic. Figure 26. Applied 3/8” boning channels with non-magnetic boning which I presume is whalebone. 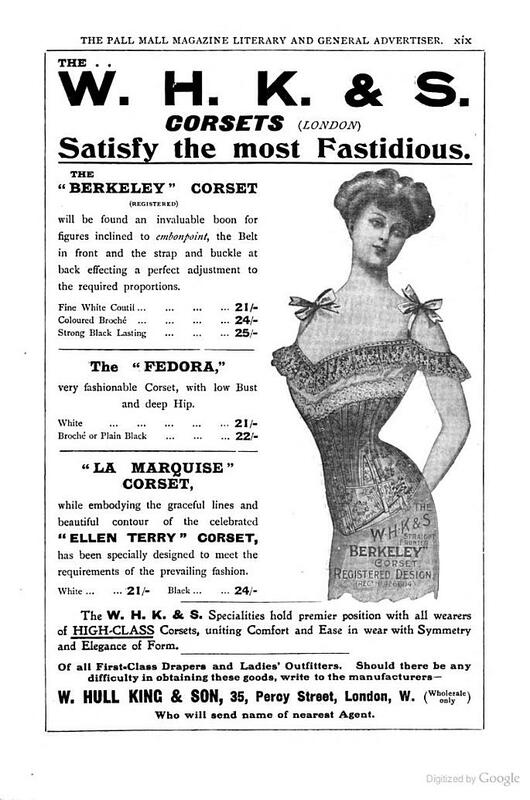 I presume this corset was mass-produced based on the advertisements from the company. The quality and details remind me a bit of the Symington collection corsets in construction, which I was able to study while in England for the Oxford Conference of Corsetry earlier this year. The flossing does appear to be worked by hand and not by machine but that was not unheard-of in mass production of the time. I have taken a pattern from the corset and am collecting suitable materials to make a close reproduction. It will be my first attempt reproducing an antique – an exciting yet daunting task. Boning channels and waist girdle in a satin weave fabric. The waist tape & boning channels are cut on opposite grains (Fig. 27). Flossing- a thicker twisted embroidery floss (Fig. 26,28). Tubular cotton lacing with round metal crimped tips 1/8” wide – I will try to source this fine a lacing and find out where to source the round aglets since I normally use square shaped ones. Figure 27. Herringbone weave of the base fabric. Figure 28. Satin weave of the boning channels and girdle shaped waist section. Figure 29. Flossing details of corset with crossed over “V” shaped flossing on the narrow and wide boning at the bottom edge. Figure 30. Running stitch detail applying the lace at the top edge of the corset. The herringbone runs vertically down the main panels of the corset. The stitch length is tiny at 1/32” which is delicate and beautiful. The lace at top is stitched on by hand with a long running stitch at top and bottom edges, whip stitched at center front and back (Fig. 29). The panels appear to be stitched together at the seams from the front with the seam. The main body of the corset is a single layer with applied boning channels. The Center front busk and the center back lacing panels have an additional layer of fabric. The seam allowance (SA) is pressed towards the outside of the corset with applied boning channels on top. The SA under the narrow channels are both pressed towards the front on the front half of the corset and towards the back on the back channel whereas the SA under the wider channels appears to be pressed open before application of the boning channels. 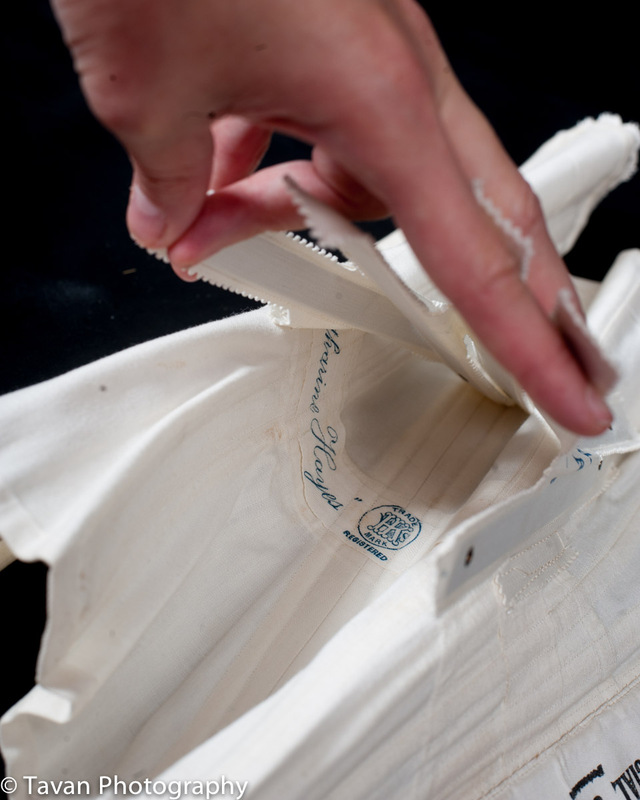 The machine stitching of the boning channels anchor the internal waist tape at each channel in the interior of the corset. The girdle is applied under all the boning channels as well as under the busk and the lacing panel. It is stitched with two rows along the top and bottom edge to the body of the corset prior to the busk, boning channel, and back lacing panel are being completed. 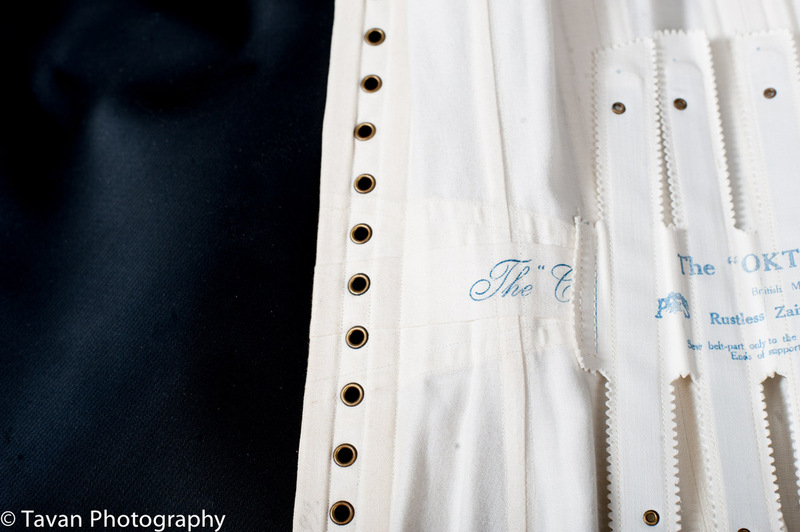 The busk and the back lacing panels have an additional layer of fabric which creates the lacing panels and the busk cover under which the girdle ends are secured at the center front and back of the corset. The special under-busk made by CBC is hand whip stitched to the corset. I have made great headway into the start of a lovely reproduction project quite unlike anything I’ve attempted before. I anticipate finding just the right lace is going to be the hardest part of the endeavor. I currently have coutils in the right weave and of very similar weight in a lovely super pale blue. Perhaps I’ll make a colour shifted version because I need to make this harder on myself by trying to match lace colour as well! However, I also have a perfect german herringbone coutil in white but will need to source the matte satin coutil in white to pair with it. My initial plan was to redo it in black and white which might become a version I alter to myself later on. This is the way of exciting projects: they push you to learn more and go beyond what you anticipated. I never thought this little corset would come with so many charming details about the past and so many more questions. My research continues.